.......53 Buddhas and Me .................My Life Adventures.....: "My Mothers Day"
Well I had the best Mothers Day on Sunday. 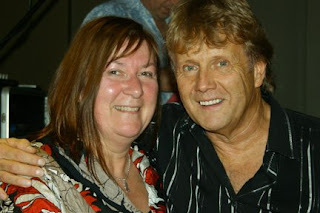 I spent the afternoon at Reservoir RSL with 5 girlfriends at a lunch and concert by Darryl Cotton...."ZOOT" fame....and for those who are a lot younger than me...Marty Monster fame. I must admit I was very very excited to be seeing Darryl Cotton as I was pretty much in love with him in my teenage years. He has actually held up very well and I think his voice has improved. Although he could have just stood there and I would have been impressed. As you can see I had my photo taken with him and I also got a kiss from him. I was like a silly teenager, my hands were even shaking. I was really taken back to my teenage years. On my way home I got a phone call from my gorgeous son..Shane...from Cairns. I know you may say tha t isn't that unusual, but for anyone who knows Shane you would know you are very lucky if he remembers special occasions especially Mothers Day. Then I spent the evening with my dear old Dad, Shane (partner), my beautiful daughter Rachel and her partner Luke. We had a lovely evening eating lots of seafood....I love seafood.... and having a few drinks. So as I said before I had the BEST MOTHERS DAY.